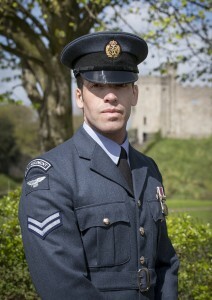 THE RAF Ensign was hoisted at Cardiff Castle today highlighting the RAF National Aircraft Tour which arrives in the capital in four weeks’ time. Raising the Ensign were members of Cardiff-based Royal Air Force Reserves, Number 614 (County of Glamorgan) Squadron and local Air Cadets. On 1 April 2018, the Royal Air Force launched RAF100, a national campaign to mark its 100th year. The centenary features events, activities and other initiatives running nationwide from April to the end of September 2018. One of the biggest events, the RAF100 National Aircraft Tour, arrives in Cathays Park, Cardiff on 18 May. Iconic aircraft commemorating 100 years of the world’s first independent air force, will be on display outside Cardiff City Hall along with science-based activities giving youngsters the chance to enter an exhilarating world of technological adventure featuring aerobatic quadcopters, cyberspace missions, hand-skill challenges and virtual-reality flight. Among the famous aircraft on display will be a Second World War Spitfire and a Typhoon jet from the present day. The Spitfire, kindly loaned by IWM Duxford (part of the Imperial War Museums), wears the markings Number 19 Squadron which served during the Battle of Britain when the RAF thwarted plans for a Nazi invasion of Britain. This Spitfire was flown by Sergeant Jenkins and shot down four enemy aircraft. Representing the present and the future will be a Typhoon fighter jet – the aircraft that is on alert 24 hours a day, 365 days a year, ready to scramble in defence of the UK. 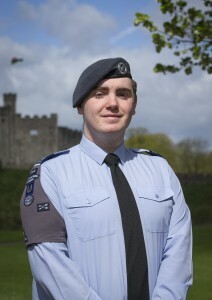 Also attending was Cadet Corporal Caisel O’Hare of 1344 Squadron RAF Air Cadets based at Maindy in Cardiff. He said: “As a member of the RAF Air Cadets, and so a part of the wider RAF community, I feel really honoured to be a part of the RAF100 celebrations. It’s inspiring to think of all the opportunities that are available to me, especially in the STEM environment. The RAF100 Tour will be a Cathays Park, Cardiff 18-20 May 2018. Opening times 11am-6pm (Fri), 9am-9pm (Sat/Sun). Free entry.